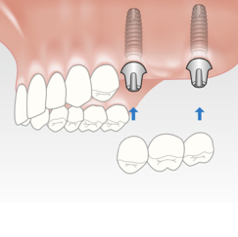 Dental Implants are a safe, reliable and well-proven solution for permanently replacing one or more missing teeth. • Eliminate the need to grind down healthy adjacent teeth as required by traditional crown and bridge procedures. 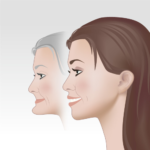 • Help to maintain facial structures and the bone tissue in the jaw. • Eliminate the use of denture adhesives and help to eliminate the discomfort of ill-fitting dentures. 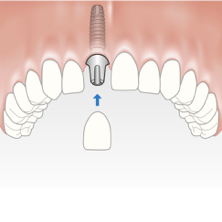 A dental implant is a small screw that acts as an artificial tooth root when placed in the jawbone. It is made of titanium, a metal well documented for integrating with human bone to create a stable foundation. 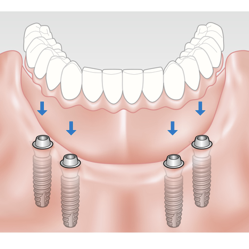 An abutment is then fitted to the top of the implant to create an anchor for the placement of a crown, bridge, or prosthesis. Dental implants have been used successfully in millions of people worldwide as a long-term solution for renewed quality of life. 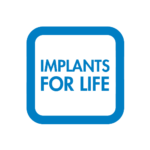 Implants by Dentsplay Sirona Implants are developed based on biological and biomechanical principles. Our implants are backed by extensive clinical and scientific documentation. 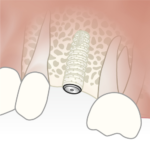 The design of implants by Dentsplay Sirona Implants also allows for shorter healing times, less chairtime for you as a patient, and the confidence of predictable long-term and esthetic results that only decades of clinical research can bring. By acting as a tooth root, a dental implant provides a stable foundation for a replacement tooth that stays securely in place, so you can eat, speak, and smile with confidence. Dental implant in actual size An abutment on top of the dental implant The dental implant with a crown Replacing a single tooth Dental implants are an ideal solution for replacing a single missing tooth and eliminating the need to grind down healthy adjacent teeth as required by traditional crown and bridge procedures. In addition to looking and functioning like natural teeth, implant-supported dentures and full bridges are designed to be an effective and stable long-term solution. Implants eliminate the need for adhesives to keep dentures in place, as well as the sores and pain often associated with ill-fitting dentures. 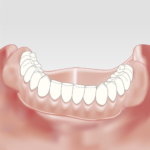 By stimulating the jawbone, implants also help to maintain the bone and the natural shape of your face. Our principal dentist, Dr Paul Lowe, is a recognised surgical specialist and has a Masters degree in dental implantology. He has over fifteen years experience of placing and restoring dental implants. Contact us on 0121 711 2424 and arrange to speak with your dentist to find out if you are a candidate for dental implants and what the treatment can mean for you. Functional and aesthetic – They look, feel and function like your natural teeth. Maintain facial structure – Anchoring dental implants in the jawbone stimulates bone tissue and gums, ensuring an attractive, aesthetic result while helping to maintain facial structures. Biocompatibility – Dental implants are made of pure titanium. This material is perfectly compatible with the body and over time becomes completely integrated with the bone tissue. Extensive scientific documentation from clinical studies confirms that implants enable very good results — over both the short- and long-term. 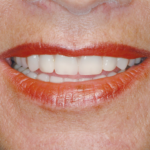 Secure bridge or prosthesis – They eliminate the discomfort and insecurity of loose, ill-fitting dentures. The ADI aims to provide the public with an improved understanding of the benefits of implantology and its Members with the benefits of ongoing education.